Elegant Themes was one of my favorite WordPress development company and even I placed them at the Top 5 Best WordPress Themes providers list. Ever since I started blogging, I have been always looking for the most powerful Themes and Plugins to have my posts most presentable and reach out to a large number of visitors. Since I own & operate multiple sites in multiple niches, it's not good to use the same Themes & Plugins and diversifying is much needed to save yourself from competitors and search engines. Elegant Themes is one such company to offer Best WordPress products not only Themes but also crucial Plugins to run an online business. Here comes the list of Top 5 Best Elegant Themes Products ever created from them. Designing a website or a blog was never this easy before. The Divi Builder increases your possibilities to design your website or a blog to a massive extent. 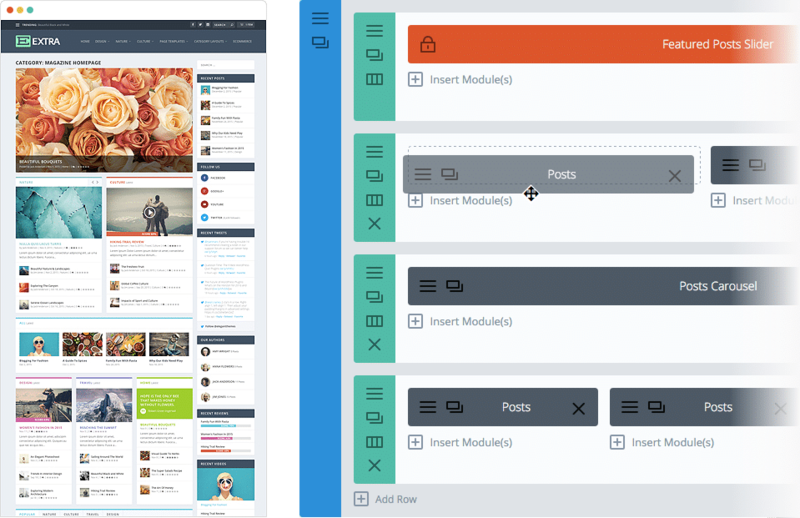 The Divi Builder comprises 3 section types, 20-row types, and 40 content modules. With Divi Builder’s advanced design settings, it’s possible to customize every single element of your website in terms of color, spacing, and topography. Divi’s large collection of content modules has helped me add content to my pages with the greatest ease. The custom code module allows you to integrate third-party plugins. It wasn’t until I began to use the Divi Builder that I realized that building layouts required no coding experience at all. Doesn’t it make things ridiculously convenient? Using Divi Builder, I could finally get rid of the boring single column blog posts and things have got pretty much advanced. With Divi Builder, layouts have certainly got so creative and most importantly, it takes only a few minutes to create it. I personally feel the fact that Divi Builder has deliberately laid a lot of emphases to help us save a lot of time. Even if you don’t want to show a certain element on the front end, you wouldn’t need to delete or remove it with complex coding and all of that. All you need to do is simply disable it and that way, you not only hide it but also keep the element for future use just in case you ever change your mind. ​​​​​​​​​​It’s pretty normal to make errors but it can be certainly frustrating in case there’s no space for undo. The Divi Builder offers you with unlimited undos and redos option which again make things pretty convenient, easy and of course, help us save a lot of time. Divi Builder comes as an individual plugin which can be incorporated with all WordPress developed themes and Extra, is one of the best Elegant Themes which was built using Divi builder. Having developed the most relevant contents, the next best thing you can possibly think of is the optimization of your posts. Well, I have had a real tough time in optimizing my posts initially despite the fact that they were all high-quality posts. At one point of time, it was almost getting difficult to manage between social media sharing and content development as both of these needed a lot of time. Finally, I came across the Elegant Themes plugin called Monarch and it worked like a magic. It offers over 20 social media sites for the visitors to choose from to share the posts. When it comes to me, I found it immensely helpful in my website’s optimization and since the time I have started using Monarch, I really didn’t have to try as hard as before on social media sharing. Monarch offer five different locations to add the social media sharing buttons for the varying social sharing needs of websites, pages, and posts. With Monarch’s floating sidebar with unique hover styles, you can certainly catch the attention of the visitors and be encouraging them to share the posts on various social media platforms. Monarch offers amazing options for media sharing be it an image or a video and I found it massively helpful too. 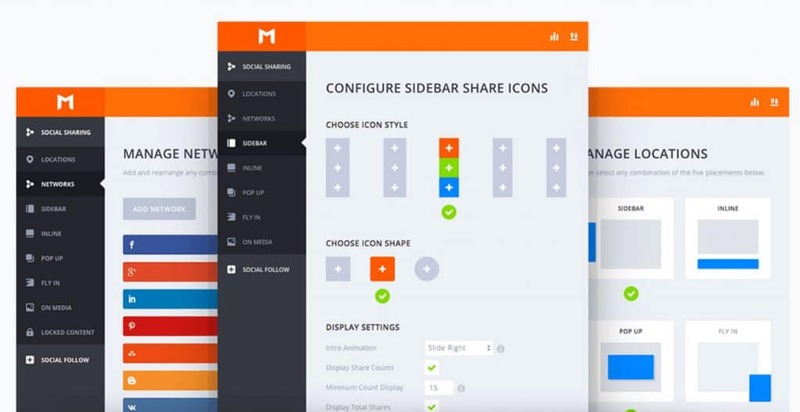 With Monarch, you can create automatic social media sharing pop-ups for your visitors displayed at a point while one is reaching the bottom of the page or about to leave. In fact, I thought it’s the most decent way of displaying pop-ups and of course, it turned out to be pretty effective for my website as well. The plugin has 6 brilliant automatic Pop-ups and fly-in triggers with Monarch and they are Timed Delay, Bottom of the post, After commenting, Upon % scroll, After purchasing and After inactivity. Best Elegant Themes aren't suitable since they develop beautiful plugins like Bloom. Bloom is another powerful plugin and I would recommend this to all my friends who have the utmost faith in Email Marketing. Email Marketing has proved to be unimaginably helpful for many bloggers and website owners over the past many years and will consistently continue to find its way. Bloom, on the other hand, has taken Email Marketing to a completely new level of effectiveness. 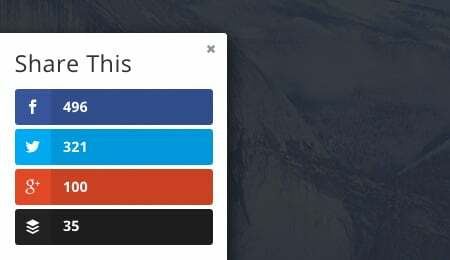 Bloom helps you target particular pages or posts and display unique offer based forms to the visitors. 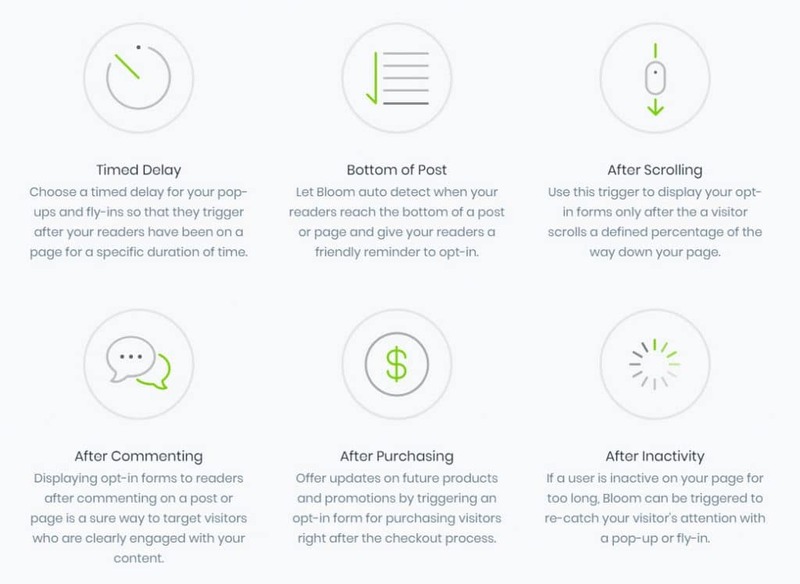 Bloom helps you create automatic opt-in-pop ups to get more and more visitors subscribed to one’s newsletters. With Bloom, create incredible inline opt-in forms for a more location-specific approach. The procedure is pretty simple and all you need to do is configure the form, generate its shortcode and paste it to the WordPress editor. It helps you create unique forms and integrate them into 16 most powerful email marketing platforms and honestly, I found it pretty helpful. It certainly gives you a lot of space to experiment with more and more Email Marketing systems. Design-wise, you can certainly have the most attractive opt-in forms with Bloom and much effortlessly than as in trying to create such a form manually. Honestly, I did waste a lot of time in trying to create a form manually and get it as close to the Bloom forms but not anymore now that I have Bloom. Furthermore, Bloom offers you with more than 100 pre-made templates which can help save a lot of time. The Bloom dashboard is pretty user-friendly and certainly easy to comprehend. It offers you with an elaborate analysis of lists, conversion rates, and data. 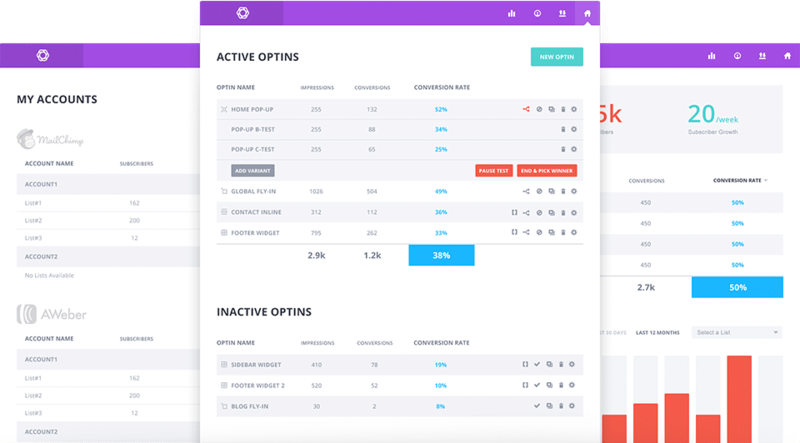 Bloom allows you to have excellent A/B testing to increase conversion rates. There are several other form options like below content-in forms, widget area opt-in forms, etc. which can greatly help you build a massive email list. Bloom Plugins is also one of the best low cost OptinMonster Alternatives. The right choice of a theme can create a huge difference. After a really long struggle to find the most effective theme for my website, I finally came across the Extra WordPress Theme powered by the Divi Builder. Currently, Extra Theme is the Best Elegant Themes I'm using for my sites. Extra allows you to create brilliant posts using the Divi builder’s highly advanced drag and drop interface with countless possibilities in terms of custom fonts, colors, sizing, spacing and more. The theme is fully responsive which means it works equally well on all the devices irrespective of the screen sizes. 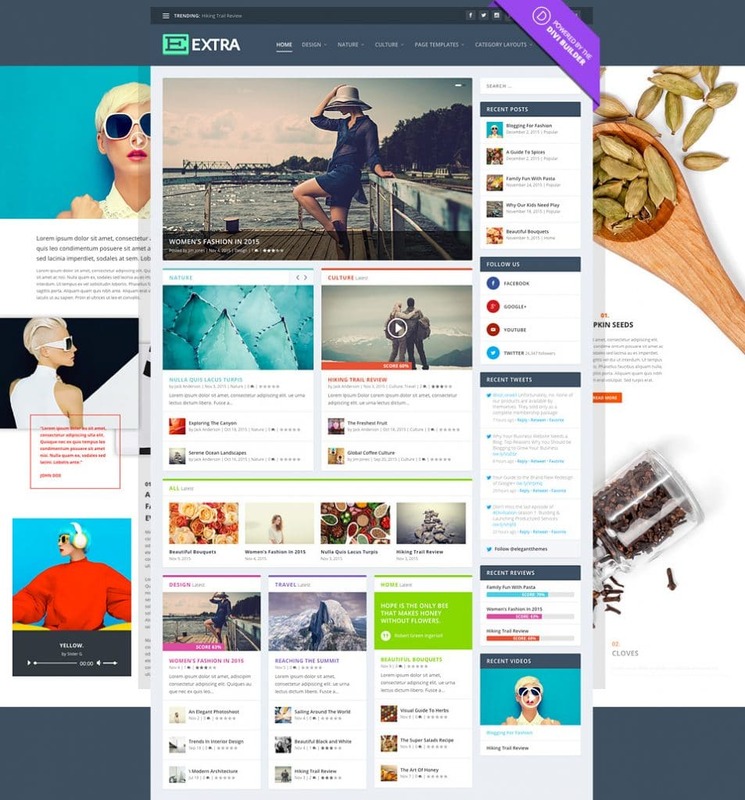 Extra has the right mix of all the important elements for every e-commerce website and on top of that, it has the most elegant design. If you are looking for a perfect theme for your eCommerce business, Extra is certainly the right choice with the WooCommerce ready setup. Some of the other stunning features include Advanced Mega menus, secondary and footer navigation options, social media integration, lovely widgets, etc. Another Best Elegant Themes to try out. The Nexus WP Theme is another all-time favorite theme of mine and in fact, there are various reasons to it. 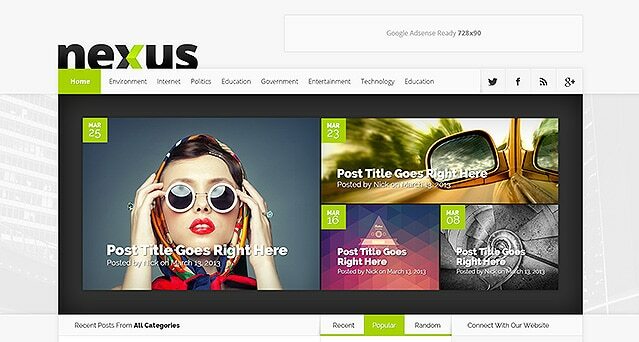 Nexus WP Theme is a perfect magazine theme with the cleanest layout for the readers. The theme uses coding best practices to ensure that the website is fast and secure. The theme offers multiple locations for displaying the ads most appropriately to catch the attention of the visitors. Nexus WP Theme is highly responsive and works well on all the devices without the slightest distortion in the beauty of the website design. The above are my favorite products and its not over here. Elegant Themes has over 88 Themes and three plugins. You can look them here and if you're running multiple sites like me, you can opt for membership plans. 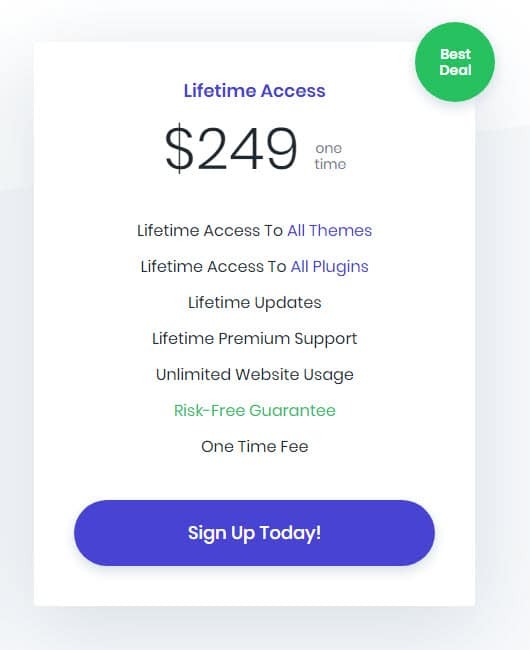 There are two types, one is lifetime membership where you will get access to all the themes & plugins and you will also get access to future releases. The lifetime membership costs as low as $249 one time fee. Yearly membership costs $89/year where you will get access to all the Themes & Plugins. I hope you enjoyed reading Best Elegant Themes & Plugins post. This is something I badly wanted to share with you all as I have had some really impressive results with these plugins and themes. Of course, it took me a great deal of research to reach to this conclusion and I hope, this will worth your while as well. Don’t just believe my words and you had better give it a try yourself.